A P R E L U D E.
The story of a forgotten statue and what happens when she comes to life. For over half a year, I listened to this song and story spill out of me. During an afternoon of exploration, an opportunity arose to partner with a ballerina and a creative team. In two short weeks, we translated this story, inspired by Sleeping at Last's Enneagram Type 4 song. I'm excited to share the full length film with you, but even more so, the deeper story behind it. This has been quite a journey of self-discovery, both painful and inspiring. I suppose that’s the beauty of growth, isn’t it? What stood out as a deep struggle for the Type 4 is the idea of significance… of being seen. I wanted to depict that by starting the story with the statue being covered and forgotten. In my mind, I imagined that she used to be admired and seen by many at a museum until one day, she was covered and left behind. In order to show the passing of time, DP Jacen Sievers had the idea to create a time-lapse with moving light. He attached lights to a DIY dolly that were right outside the window. My studio manager Suzy, on my cue, pushed that dolly so that the light rays moved across the room - the way natural light does when the sun shifts over the horizon through the passing of time. Brilliant! Our set designer Lindsey set the tone by centering our ballerina Juliet (who played the main ‘statue’) in the midst of other statues that faced her. All eyes on her. Over time as the fabric begins to slip away, it reveals her. She comes to life, only to desperately seek to rediscover who she really is. Surrounded by other statues, I directed Juliet to dance with full energy (as if ‘coming alive’) as well as interact with the statues around her, pretending to shape them as if she is the sculptor herself - longing to be more than covered, longing to be the creator. She easily sees the beauty in the statues around her, but for her own worth - she needs the eyes of others (the museum goers) to affirm and validate her beauty. The statue begins to fight the very fabric that covered her to begin with. She refuses to be unknown and invisible again, she refuses to go back to that life. But in reality, if she embraces the solitude and the covering, this is where she will truly find herself. Her mirror used to be the eyes of her admirers reflecting her glory, but this became lost when she was covered - she was forgotten. It isn't until she catches a glimpse in the mirror of her true reflection, not in the eyes of others, that she sees her own glory. She walks back to the place where it all began, unafraid of being covered because she now knows the truth of her significance: it is inherent - not given or determined by others. Her significance doesn’t come from being seen, it comes from simply being created in the first place. Our self worth isn’t up for grabs. This story means so much to me because it is just a tiny illustration of what our hearts wrestle with when we create. Who will see it? Is it good enough? Is it worth it? Who do I think I am? We lose sight of why we began to create in the first place. For me, I create so that others feel understood and known, that they are reminded that in the midst of darkness we can always find light no matter how small it may be at first. Remember when we were kids and we made silly treasures? Remember the desire we had to share it with others; to share a piece of ourselves with them? Remember how much bravery it took and we did it anyway? Because at the risk of - no, WHEN rejection and failure happen, there is someone who needs to hear, see, or feel that message from you. Even if it’s only a whisper and even if it needs to be from a place where no one else will see. Truth will find its way. To the team that made this happen - I can never thank you enough. 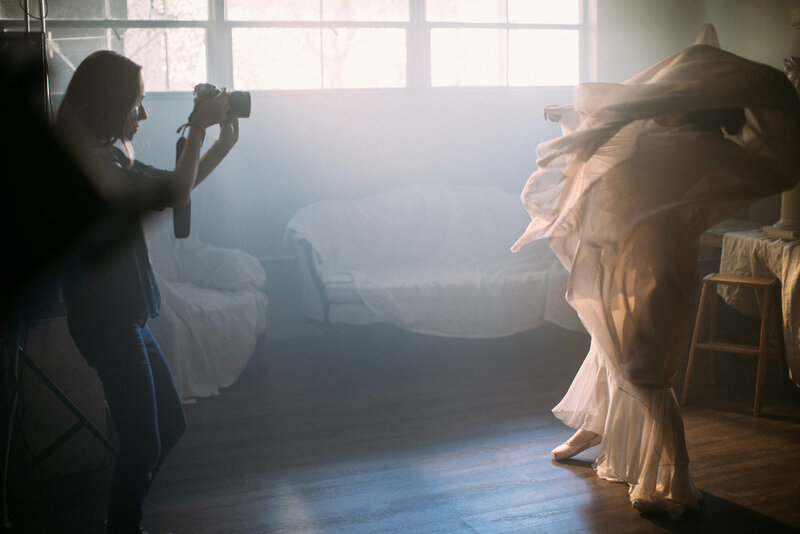 Director of Photography: Jacen Sievers, Ballerina Statue: Juliet Doherty, Set Design: Lindsey Steed, Studio: The Gray Atelier, Dress Design: Newhite, and my girls Emily Joy (brilliant BTS content), Elizabeth Grace, and Suzy Goodrick for support and on-set magic.